A new year always gives us a fresh new outlook on life. New routines, implementing a healthy lifestyle, and a refresh of our homes are usually at the top of the list. I’m here to show you how to give your home a refresh & a new slate. The best way to accomplish this is by participating in our yearly home organization challenge. This is our 8th year of the challenge and there are thousands of you joining in. Each year, the challenge just gets better and better and so many more of you are now a part of this tradition. If you would like to purchase any of the items featured in this post, check out my favorites shop here. FIRST TIME PARTICIPANTS: Welcome to our challenge. You are in for a delightful surprise. For those returning, welcome back. Your homes will improve with each year that you participate. I’m so glad you are all taking the steps to a better new year. You won’t regret it. 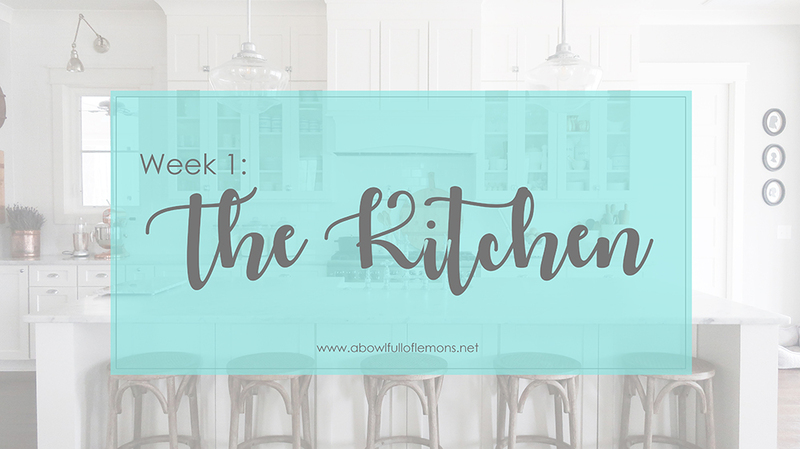 WEEK 1 TASK: We are kicking off the challenge in the kitchen. This is the most used space in the home. Not a day goes by that it doesn’t get used, so clearly it will become the most disorganized space at one point or another. 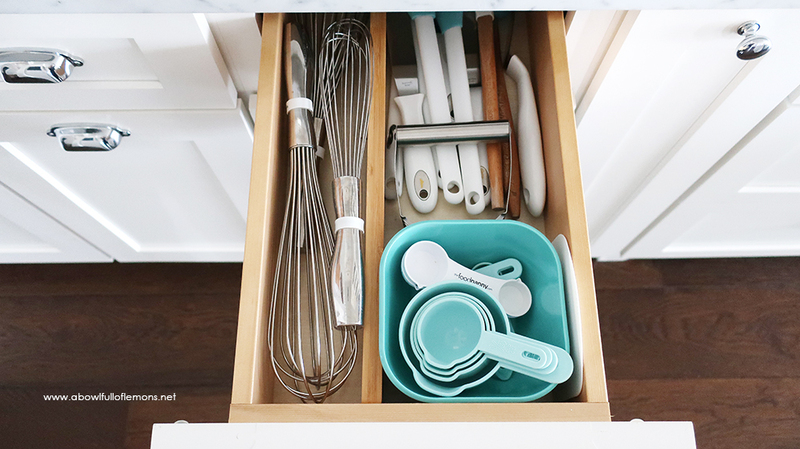 If your kitchen organization isn’t working anymore or if you don’t have zones set up to help you work efficiently, it’s time to hit the reset button and start over. You have 7 days to complete the first challenge. Break it up into several days or take one full day to conquer it. Go with whatever works for you. You can complete the challenge whether you are a stay at home mom or a full time worker. Make the challenge work for you. Before you begin, print out the complete 14 week schedule and checklists below. For the perfect companion guide to our challenge, purchase The Complete Book to Home Organization. It includes all 14 weekly challenges and will be your guide over the next 14 weeks, as you tackle your spaces. No need to log onto the computer for ideas, this manual has it all! 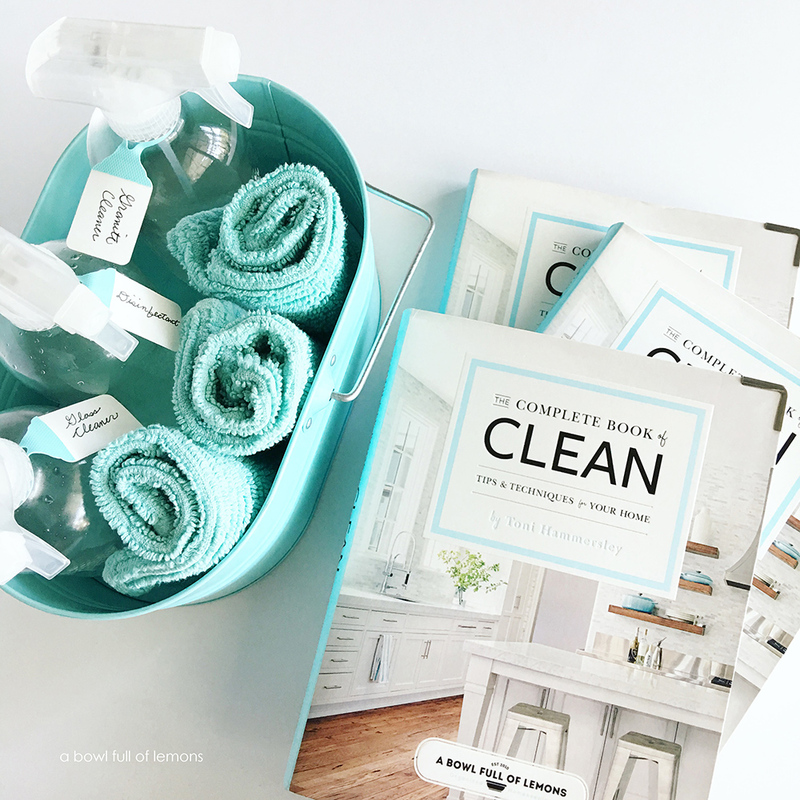 For help with cleaning your house during the challenge, be sure to get the complimenting book The Complete Book of Clean. It has tons of cleaning recipes, tips, and checklists that will teach you how to get your homes sparkling clean. Welcome to day 1 of the 2019 challenge. We will be spending the next 7 days in the kitchen. If you are new, look over the challenge details then begin working at your own pace. For encouragement, join our Home Organization Facebook community to share your progress, or struggles, or questions. Or simply look through the photos and read how others are doing. 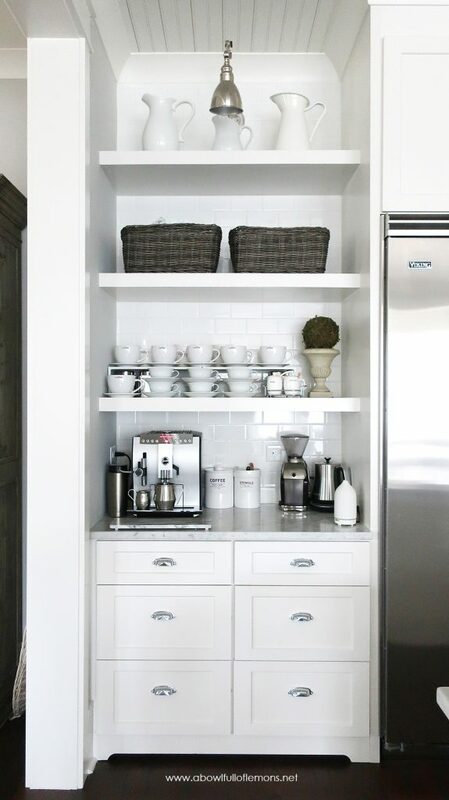 Clean out and organize all cabinets. 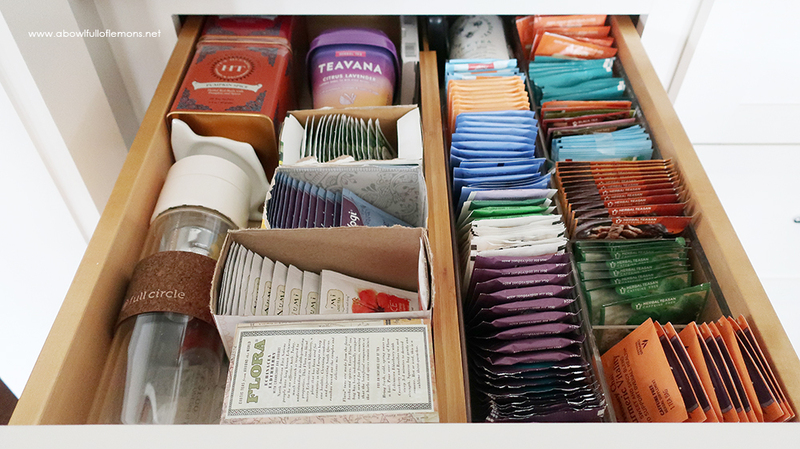 Clean out and organize all drawers. Purge everything that is not used, expired, doesnt belong, collecting dust. Clean out & organize the refrigerator & freezer. Mop, wipe down cabinet doors, clean counter tops & tables. Take everything off the refrigerator door. It makes the kitchen look messy. Clear off the kitchen table. This is your dumping grounds. 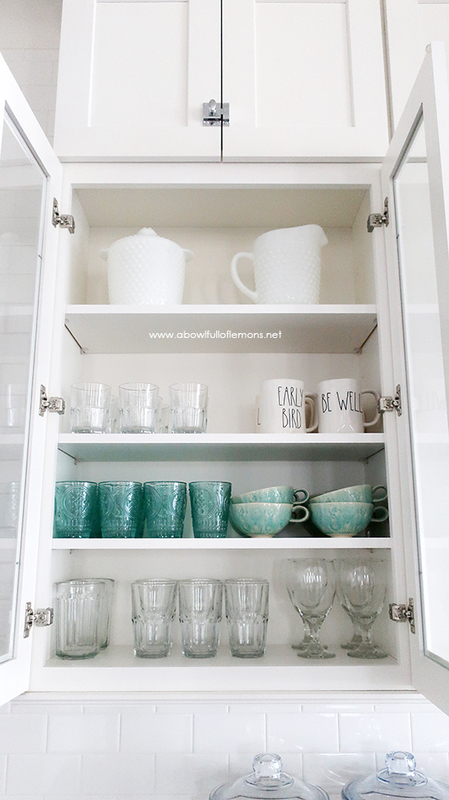 Empty out all cabinets & drawers! Place ALL items into “categories” on the table. Wipe down the cabinet doors, shelves and drawers. Add new liners if necessary. Discard (trash) old, expired, and no longer used items & food. Check the dates. Place all items that are able to fit, into baskets. 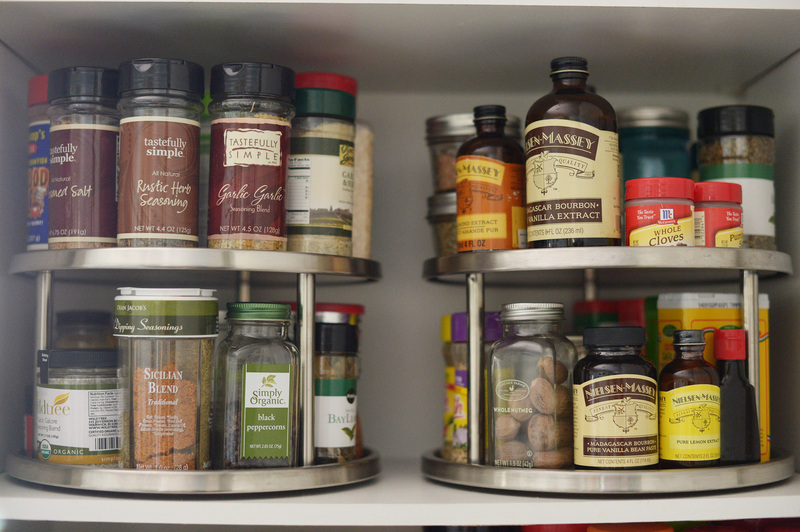 Place everything back into the cabinets & drawers (in categories). Take everything off the kitchen counters and place onto the table. 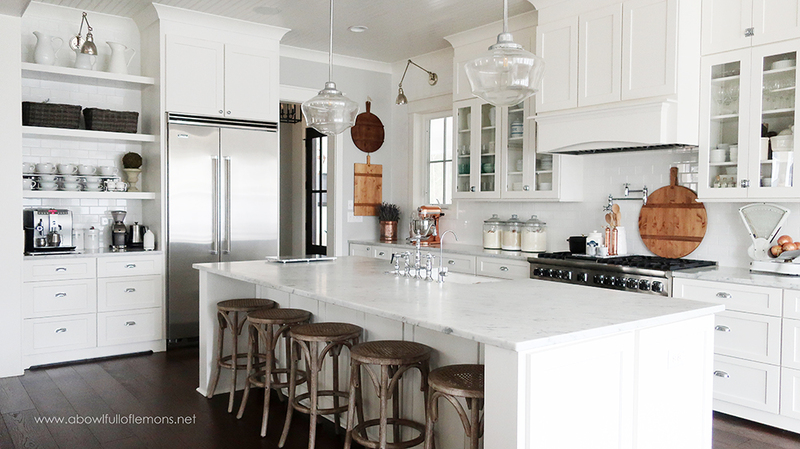 Wipe down the counters & backsplash with a good natural cleaner. Wipe down ALL small appliances & large ones too! Put back items you use on a daily basis, onto the counter top. Mop the floors and wipe down the table & chairs. Empty fridge/freezer. Wipe out. Put back in an organized manner. 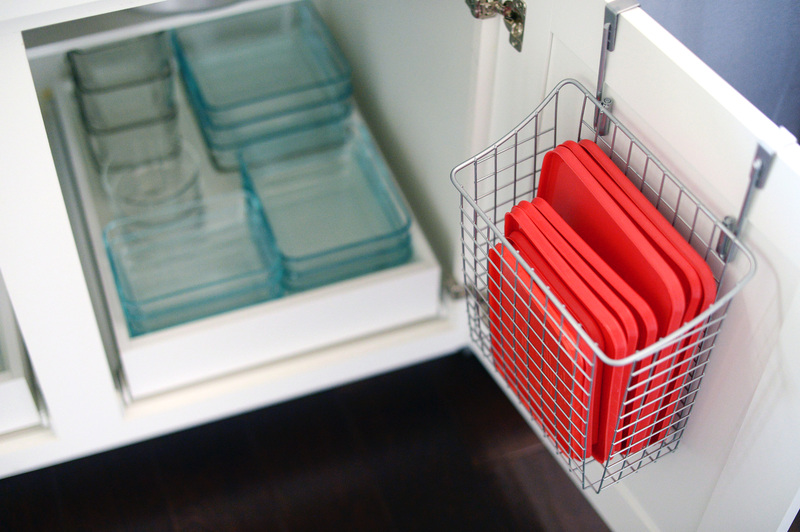 Clean and organize under the kitchen sink. 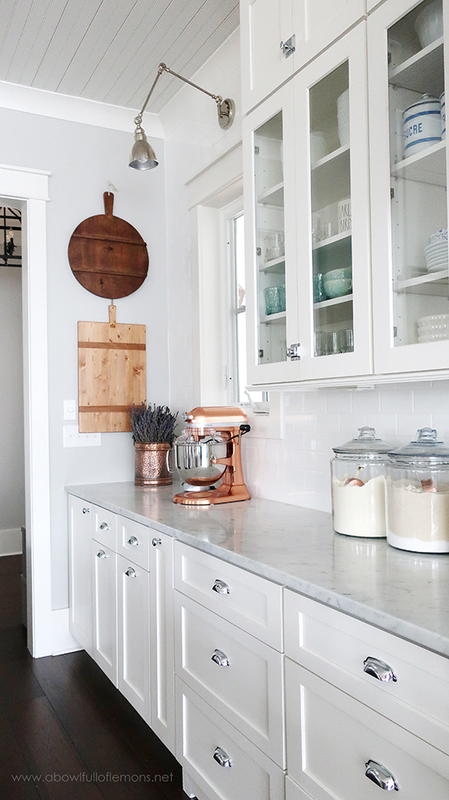 Tip: Keep all clutter off the counters at all times. If you take it out, put it away! We have been in our new home for 5 months now and I am still in love with our kitchen. I designed it with many drawers. Drawers are easy to organize and I wanted easy. Like my old kitchen, I’ve set up the new space into zones so it will function well for our needs. 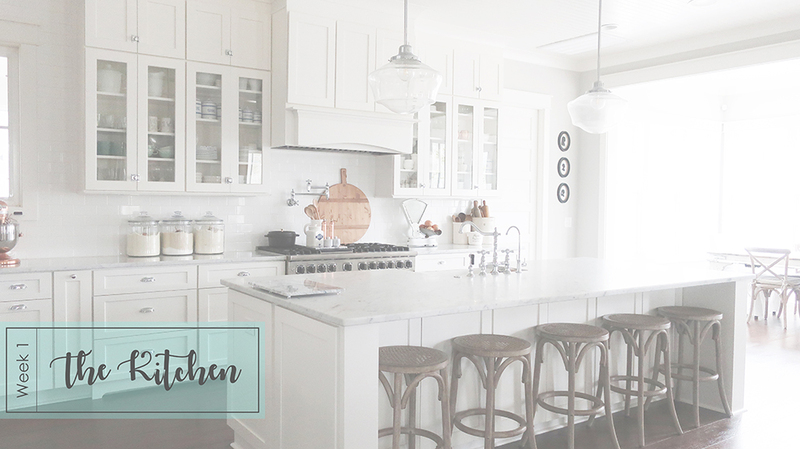 Keep reading to see how I organized the zones throughout my kitchen. Hopefully this will give you the motivation you need to begin the challenge. DISHES. I love dishes and I want to be able to show them off, so we had glass doors installed in our new kitchen. 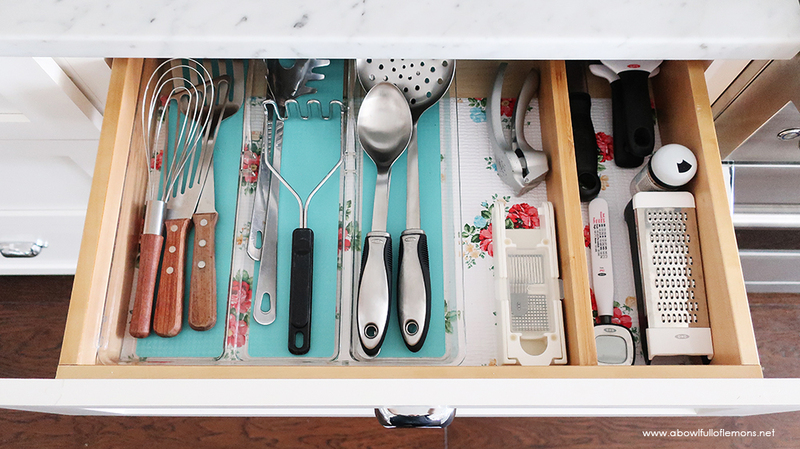 When organizing your dishes, keep similar items together. 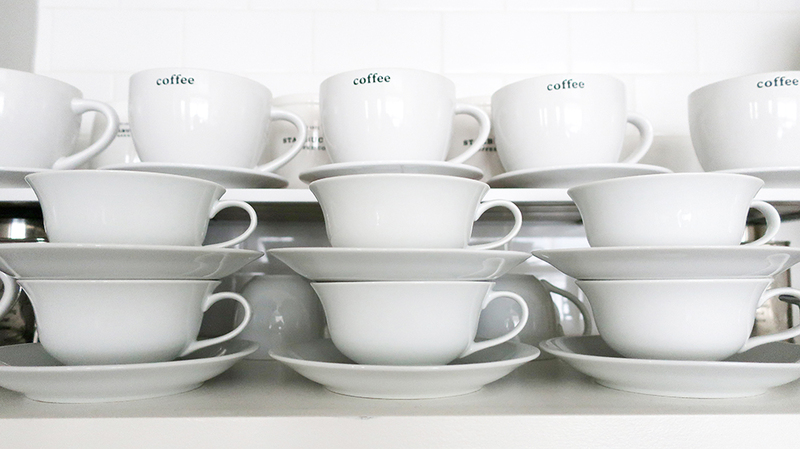 Organize cups, glasses, and mugs together. Place plates and bowls together, etc. Similar items grouped together (and in line) are more visually appealing. 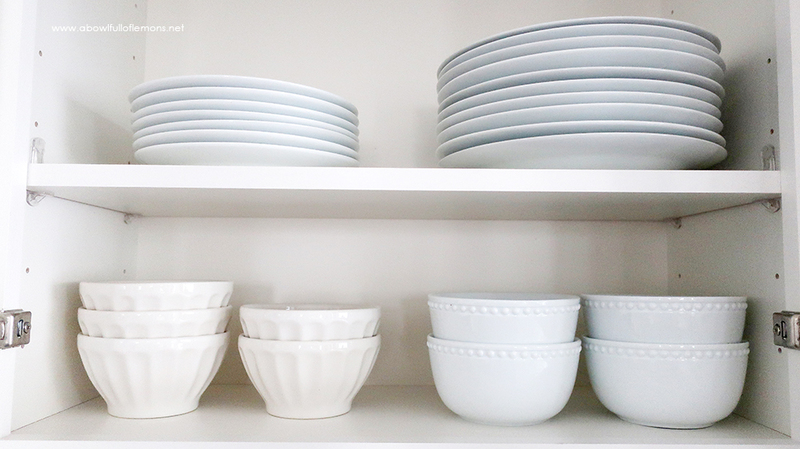 And white dishes look less cluttered and streamlined when displayed. FOOD STORAGE CONTAINERS. Toss your old mismatched plastic bowls and lids and invest in quality (and healthier) glass food containers. 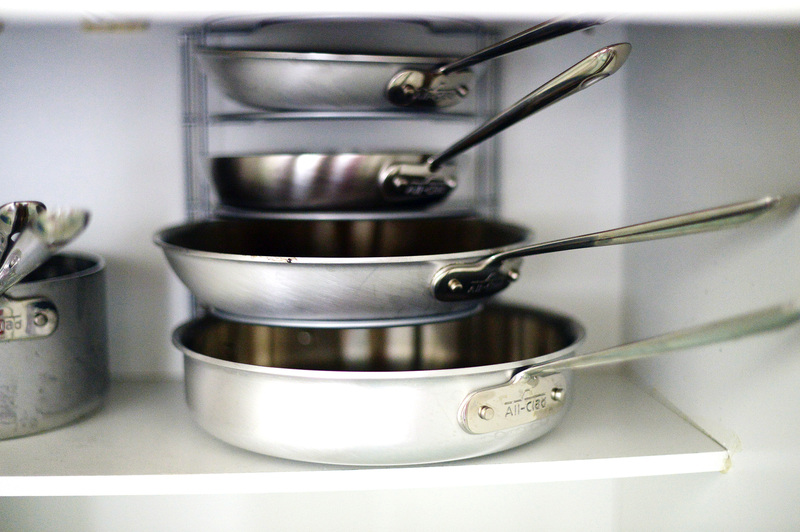 Once you do, organize the lids separately into ‘over the door’ baskets. They will make your life so much easier, I promise. You can find the organizers here. SPICES. I have a lot of spices. I cook at home 5-6 nights out of the week and I use them often. Keeping this spot organized is the key to my sanity. 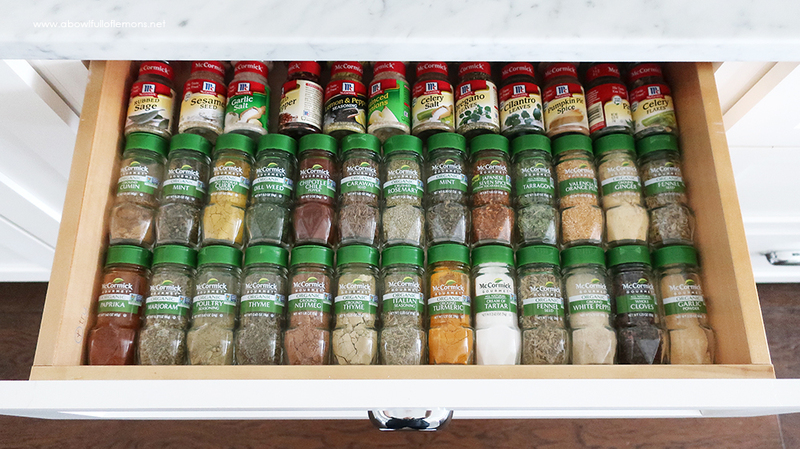 I keep my spices in a drawer near the range for easy reach. It’s simple and functional. I could go even further and alphabetize but I’m good with this for now. If you don’t have drawer space, lazy susans are the way to go. You can find these here. SKILLETS AND PANS. 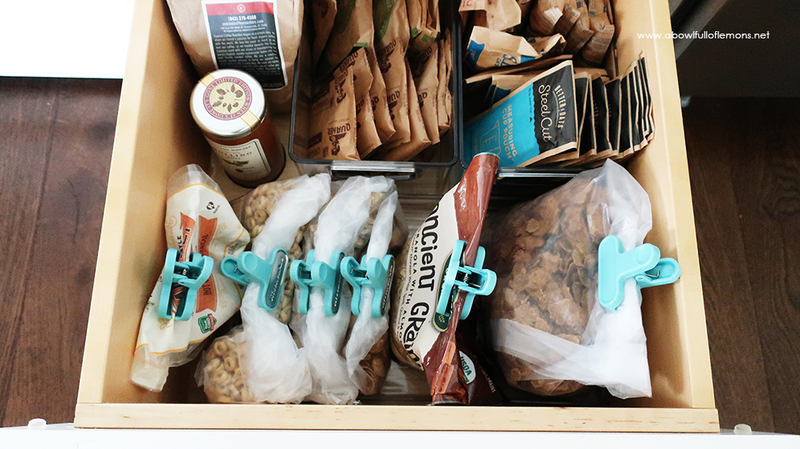 Store these feisty things in a wire kitchen organizer. You will thank me for this tip. Trust me, it has changed my life. Purchase one similar to mine here. 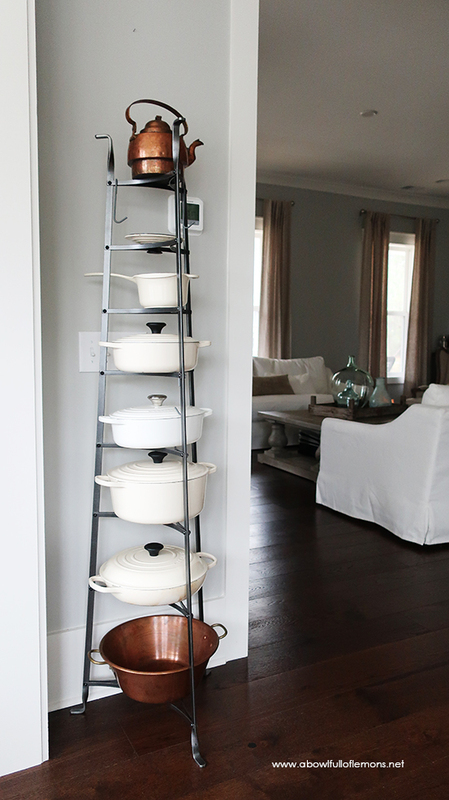 If you have heavier pots like Le Creuset or Staub cast iron, this tower may be a better option for you. It’s easy to grab what I need, when it’s time to cook. You can find this one here. 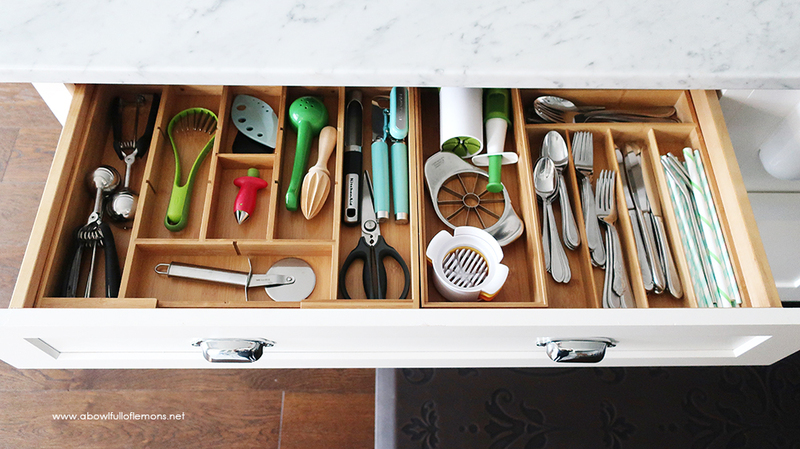 UTENSILS: I keep all of our eating and cooking utensils in drawers. If needed, I separate the drawers with bamboo dividers. You can find them here. I also love these bamboo utensil trays. 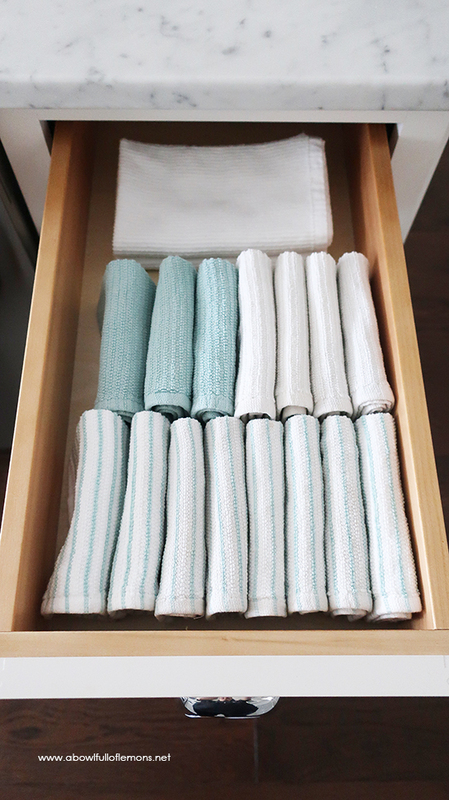 KITCHEN LINENS & CLOTHS: I use the Konmari method of folding my wash cloths. It’s visually appealing and they just fit better this way! 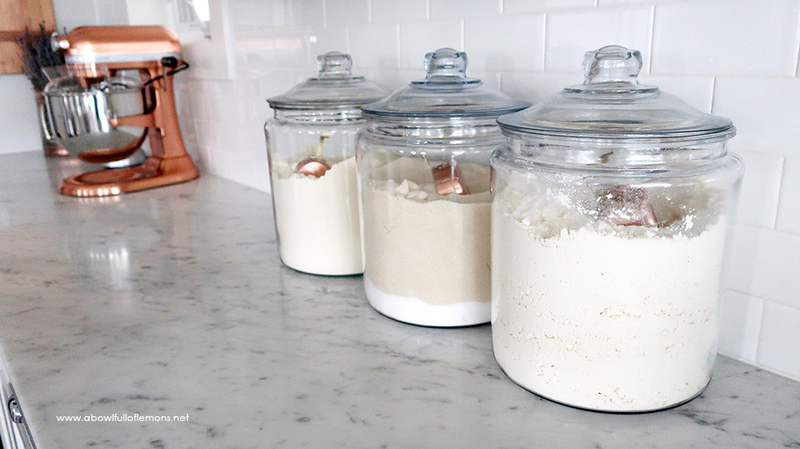 COUNTER TOP STORAGE: If you cook or bake a lot like me, you may want to keep your mixer and flour/sugar displayed in glass containers on the kitchen counter. There’s no need to go digging for these, if you use them often. You can find these 2 gallon jars here. 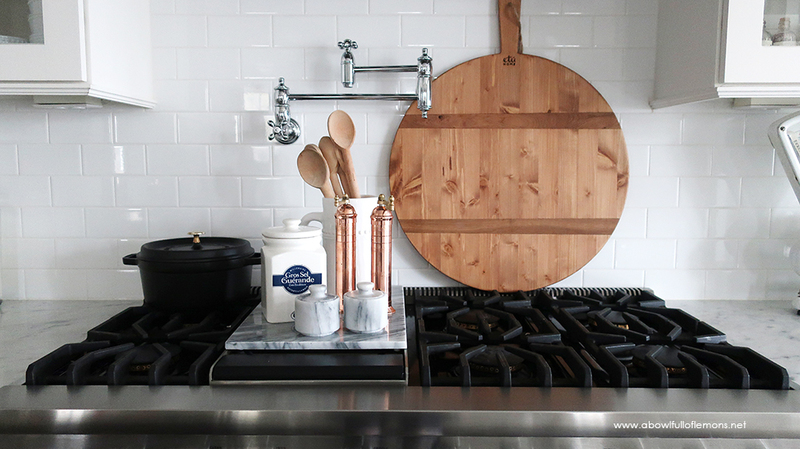 I also keep my French salt collection, pepper mill, and wooden spoons on the stove top. I use these items daily. 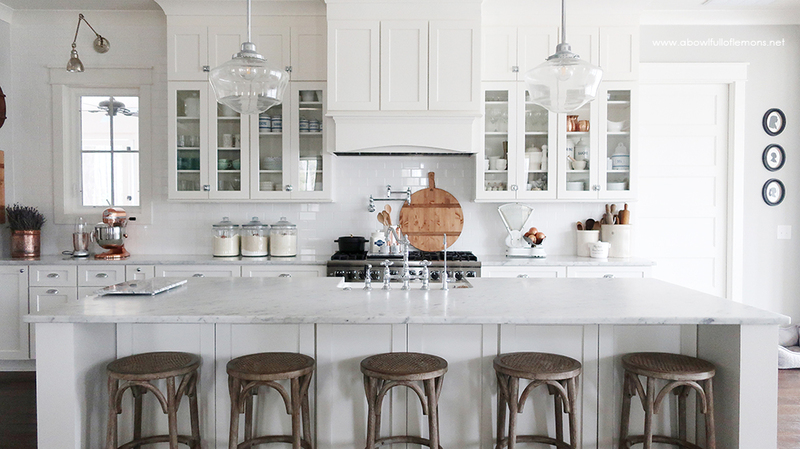 You can find more of my most loved kitchen items here. BEVERAGE/COFFEE STATION: To the left of the refrigerator is my favorite area of the kitchen. I keep all coffee and tea related items in this spot. 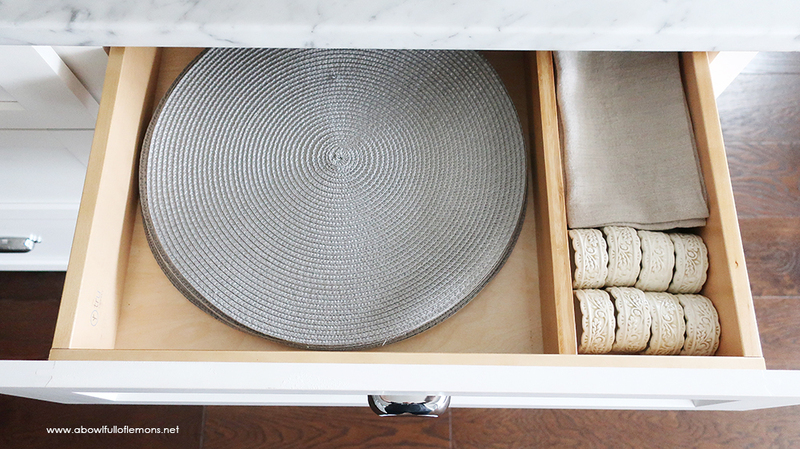 If you don’t have cabinetry to fit these items, you can use a hutch or buffet table. Use your imagination. 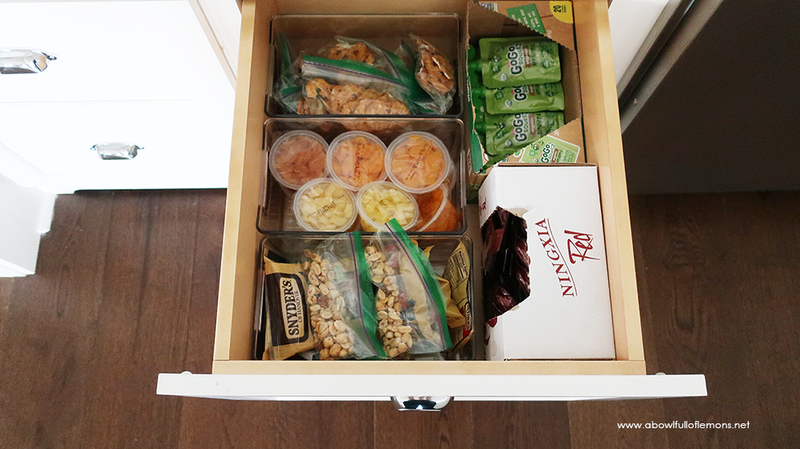 FOOD STORAGE: I will share our “pantry” with you next week, but here’s how we store breakfast and snack items in our kitchen drawers. I always take cereal out of the boxes and use chip clips to close them. It saves so much space. I got the clips at TJ Maxx, but you can also find them here. 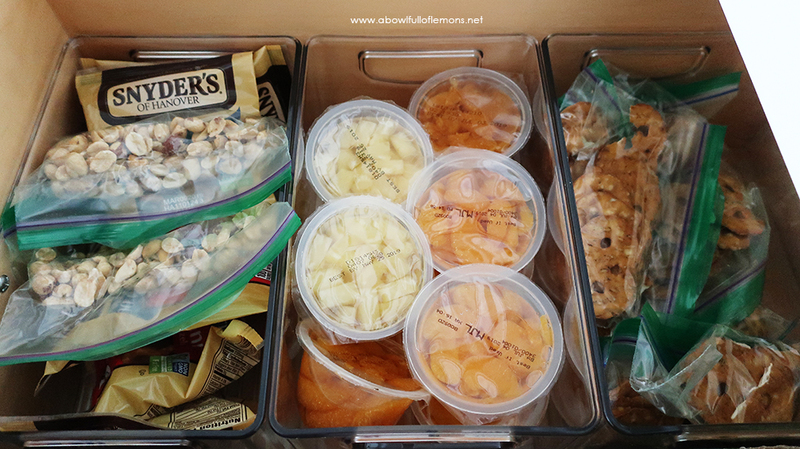 I use organizer bins to store just about everything in my house. This size works great in drawers. Find this exact bin here. I hope you’ve enjoyed a tour of our new (organized) kitchen. Be sure to tag me on social media, if you’re participating in the challenge. I would love to see your progress. Use the hashtag #abfolchallenge and @abowlfulloflemons. If you love my kitchen and want too shop my favorite products, visit my shop here. If you need more inspiration, here are some in depth organizing posts from my kitchen. Take the next seven days to tackle your kitchen. Follow the step by step process I’ve laid out for you. Make sure to set up organized zones for better functionality. (You can find the zones I use in my book). Try not to get side-tracked and don’t move ahead until you are completely finished with the space. Share your progress on Instagram using the hash tag #abfolchallenge, blog about the weekly challenges, and share your before and after pictures over at my Home Organization FB group here. Hold yourself accountable and finish all 14 challenges! I can’t wait to see what you accomplish. Good luck. I’ll see you back next week for the week 2 challenge. Happy Organizing!